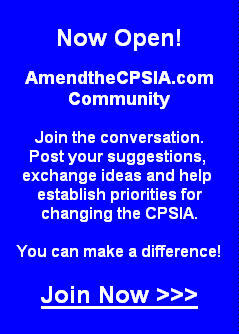 CPSIA - Comments & Observations: CPSIA - That's all, Folks! Rick, thank you for sharing the actual data, information analysis, legal insight, the rally, the hearings, and media exposures as the ground for us to stand and fight on all this time. From your effort, we have learnt, witnessed, and experienced clearly how we are being insufferably played by our Congressmen, our Senators, and our President for nothing. Obama is likely to throw the QE3 six months before the election for another four years. I think there is very little we can do about that. But no matter what, for all coming elections, I won’t let my representatives forget about the CPSIA, and I will share the CPSIA experience and your blog with all my friends and families, for them to take their votings very seriously. I am very sorry that this terrible law could not be properly amended. I'm also very sorry that my senator is still quite stubborn on this law and I am praying that he is not going to be reelected this round and that we get a second clear-thinking person in the senate. Please keep your blog up so it will show up in internet searches. Your research, clear-thinking, etc should not be taken down. Thank you, Rick. You've been an important voice for so many smaller companies in this fight. We understand that and appreciate all of the hard work. Thank you for all you've done, Rick! I appreciate you keeping us up-to-date with your blog. I still have hope. I will miss my daily visits to your blog. Thank you, Rick. I, too, will miss your blog. You and I are on different side of the political fence and I didn't always agree with some of your political swipes (though some were admittedly well-deserved), but I always thought that your product safety analyses and focus on risk-based approaches were well thought out and supported by facts. That is the way it supposed to work. We can disagree on our views, but facts are what bring us together in order to make the best decisions we can for all interests. I agree that this HR 2715 is a joke. You will guess correctly that I am not in the business of ATVs, books, resale or bicycles. I will miss your blog, but I am not surprised at your decision. You have carried the weight for all of us for a long time and deserve the break to get back to your life and your business. Best of luck to you and Learning Resources! Your keen eye for facts and excellent insights have been a beacon of rational thought. We owe you a huge debt for the straight talk and fearless persistence. Thank you for writing honestly and bravely about such a misunderstood issue. Rick,thank you for everything you have done. Although I am part of one of the 'saved' groups (resale) this 'relief' comes far too late to help me. After coming perilously close to bankruptcy, I managed to get out of my lease and close down my resale operations with a shred of money and a mountain of debt. So the only relief I will now enjoy is knowing I don't have the burdens of being a business owner since I have had to rejoin the ranks of the employed to begin the long paydown of my debt. The CPSC and their fearmonging friends successfully scared off many of my former resale customers. So I can only sigh and work for governmental change in an incremental way and hope that companies such as yours can find a way to survive. Rick, we in the resale industry, and we who could not get over the stupidity of this law, salute you for your hard work, deep research, and unbiased eye on reality. You have given it the good fight, and hopefully educated some people along the way. America NEEDS more people like you! Thank you for being who you are. As I'm watching the Commission webcast on component testing and certification, I realize how much I miss Rick's "cynical special interest" comments and analysis. Rick, Thank you for your tireless work on this issue. You did work that many of us couldn't do - representing so many of us who wanted and needed a common sense approach to safety. I too stopped bugging my representatives as they had no interest in helping right a serious wrong. Instead, I am working to vote for the people who will stand for good common sense and praying that the tyrants in office are thrown out. I think the most fascinating thing to me, after watching the CPSIA debate for over 2 years, is that I never once saw a rebuttal to Rick's detailed analysis of the flaws of this law - not from Congress nor the consumer groups. Congress obviously knew of his arguments. They invited him to speak at hearings. They appeared to listen to his testimony. Then they blundered on as if he wasn't there. Instead of looking like an intelligent body of legislators, Congress looked like an out of control oil tanker on a collision course with the docks. The very legislators that I have voted for in the past helped set this ill fated tanker on it's course. Since then they have been deaf, dumb, and blind in the face of Rick's and others very cogent arguments that the course may not be correct. I WILL NEVER VOTE FOR THEM AGAIN. The Dems are completely self-justifying so you won't ever see them own up. Even the fact that recalls are down is a meaningless statistic. They won't talk about injuries related to recalls . . . because it might their actions look like economic crimes. Shame on them!